This is a guest post from Dag Endresen, who is the manager for the Norwegian participant node of the Global Biodiversity Information Facility (GBIF). Data for biological species on where, when and what define the so-called primary biodiversity information and is recognized as the minimum information requirement for fundamental biodiversity scientific research activities. Species distribution modelling is one of the important research tools for understanding the ecology of species, and is dependent on available primary biodiversity information (where, when and what) (Soberón and Peterson 2004). Other notable uses of primary biodiversity data includes refining range map boundaries, understanding inventory completeness, validating knowledge about habitat associations, understanding trait variation, providing knowledge about preparations that include tissues, and more. The total number of museum specimens in worldwide natural history collections are estimated to be somewhere between 1.2 billion and 3 billion (Ariño 2010, Duckworth et al. 1993). The specimens archived in the natural history museums during more or less 250 years, provide a unique resource for understanding biological and ecological processes across time and place. A very low proportion of these museum specimens have been recorded electronically into databases, perhaps as low as 5% for many collections (Krishtalka and Humphrey 2000). The biggest challenge for efficient utilization of the natural history collections remains the lack of access to electronic information on the specimens (Smith and Blagoderov 2012, Pensoft Publishers 2012). Large-scale digitization activities, such as the prioritized and ongoing digitization of the natural history collections in Norway, are forced to focus on the registration of only the very bare minimum information for as many specimens as possible to make any reasonable progress with these enormous specimen collections. To maintain maximum speed of digitization, specimens are photographed and only the scientific name of the species and the country where the specimen was collected is registered. The specimen images include a visual representation of the label and for most specimens this is the only source of information regarding the collecting site and the data when the specimen was collected (the so-called fundamental primary biodiversity information of where, when and what). Crowdsourcing the electronic registration of these details from the specimen labels could be one realistic approach to capture this information in a reasonable timeframe (Hill et al. 2012). * Discovery of biodiversity information: Transcription of label information and electronic registration into online databases greatly improve the discoverability of museum specimens for the purpose of scientific research and other public use. * Education: Students from high school level to graduate and post-graduate level can engage with the photographs of the museum specimens and take part in a first class learning experience in interaction with this resource of primary biodiversity information. * Scientific research: Scientists that study natural history need readily access to primary biodiversity information made available from museums and their online databases. Using the transcription portal they can directly take part in making the primary biodiversity information they need for their own research available by transcribing the labels for the respective species groups and or countries that they study. * Public good, open and free online biodiversity information: The information that we gather from the transcription portal will flow into the museum specimen database and be published to open and free data portals such as the Global Biodiversity Information Facility (GBIF) and the Encyclopedia of Life (EOL). The valuable information to document historic biodiversity patterns are thus preserved not only for future generations, but also made available for current research using up-to-date and modern web technologies. The collections at the Natural History Museum in Oslo include an estimated total of more than 6 million specimens (Mehlum et al., 2011). The collections in Oslo are estimated to hold more than 65% of the specimens held by natural history museums in Norway. 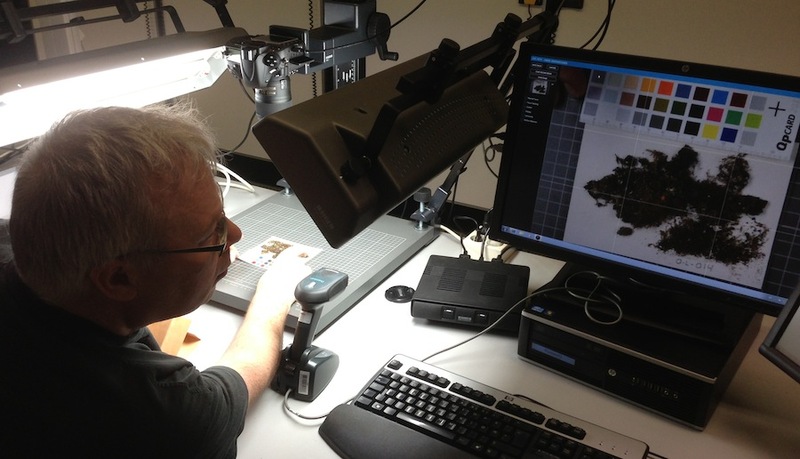 The digitization of the Norwegian natural history collections has high priority and has reached a level of more than 50% of the specimens recorded and added into an electronic database system. This is a high proportion digitized when compared to other large natural history collections worldwide, but the estimated efforts required to complete the appropriate registration of all remaining specimens are enormous. The Natural History Museum in Oslo started a large-scale digitization activity in 2013 where specimens are photographed and only the very minimum information of the scientific name and the country where the specimen was collected is registered. Capturing additional information such as the collecting location (where), collecting date (when) and the verified current scientific name (what) will substantially increase the scientific value of these data records. 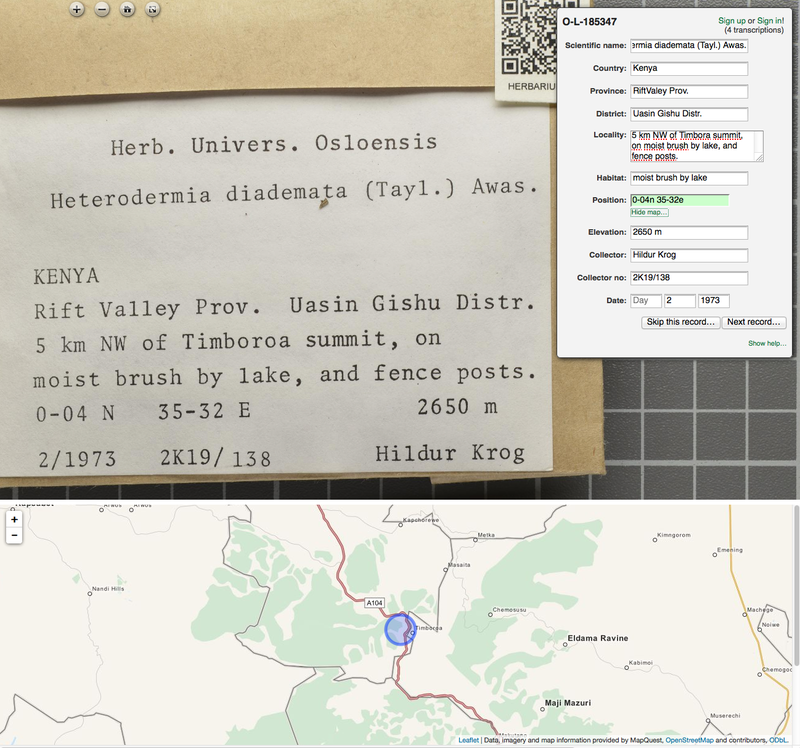 The first specimen collection that has been loaded to the Norwegian citizen science transcription portal includes lichens collected by the Norwegian biologist Hildur Krog and others in East Africa. Professor Hildur Krogh was originally introduced to limnology as a student of professor Eilif Dahl (1916-1993). Eilif and Hildur pioneered the work on chemical methods for identification of lichen species. Hildur was appointed curator of the lichen herbarium at the Botanical Museum of the University of Oslo in 1971. Between 1972 and 1996 Hildur Krog and T.D.V. Swinscow explored systematically the lichen genera of East Africa for the development of the flora “Macrolichens of East Africa” (figure 2). Already more than 10,000 specimens from Africa has been digitized and registered in the museum database, but still some 2,850 exist only as image files. We are asking the help from volunteer citizen scientists to register the label information from these image files. The imaging of this collection was made late 2013 and early 2014 by Silje Larsen Rekdal and Even Stensrud under the coordination of lichen curator Einar Timdal and Siri Rui (NHM-UiO) and with funding from GBIF-Norway (figure 3). 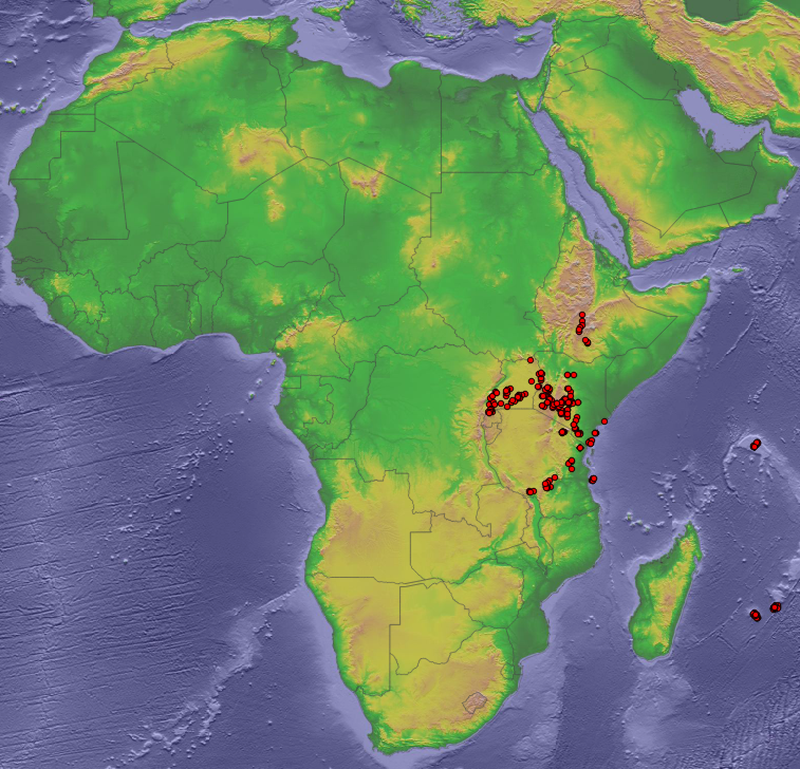 Figure 2: Collecting sites for the already registered East African Macrolichens collected by Hildur Krog et al. (1972-1996). The images loaded to the crowdsourcing portal describe specimens from similar locations in the same region. Figure 3: Curator Einar Timdal photographing specimens from the lichen type herbarium at the Natural History Museum in Oslo, January 2013. Photo: Dag Endresen (NHM-UiO) CC-by-4.0. The aim is to integrate this Norwegian crowdsourcing portal for Lichen specimens better into the NfN platform. The NfN site provides already a gateway overview to natural history collections and herbaria datasets from several distributed institutions. So far, all of these connected datasets use transcription software provided as an integrated part of the NfN portal. However, to allow the NfN platform to grow, we propose a slightly modified model where NfN could act more as a gateway “consortium” platform with more flexibility for individual datasets of specimen images to run on locally installed transcription services, including services using different software implementations. The appropriate role of NfN could be more of the entry point portal and a common gateway for volunteer citizen scientists, and less of the actual technical software solution for making the transcriptions. A more modular design would also make it easier for a team of somewhat loosely connected developers to improve on smaller parts of the system in a collaborative manner. Participating institutes could use a simple web interface, such as a standardized json format, for reporting progress and other key properties of sub-collections that are offered for transcription to volunteer citizen scientists. Technical solutions such as OpenId login could provide easier user registration and synchronization of user information for users contributing to the transcription of many datasets. Ariño A (2010). Approaches to estimating the universe of natural history collections data. Biodiversity Informatics, 7:81–92. Duckworth WD, Genoways HH and Rose CL (1993). Preserving Natural Science Collections: Chronicle of our Environment Heritage. Washington, DC: National Institute for the Conservation of Cultural Property 140 pp. Mehlum F, Lønnve J, and Rindal E (2011). Samlingsforvaltning ved NHM – strategier og planer. Versjon 30. juni 2011. Naturhistorisk museum, Universitetet i Oslo. Rapport nr. 18, pp. 1-89. ISBN: 978-82-7970-030-2. Available at http://www.nhm.uio.no/forskning/publikasjoner/rapporter/NHM-rapport-18-samlingsplan.pdf, accessed 28 May 2014.